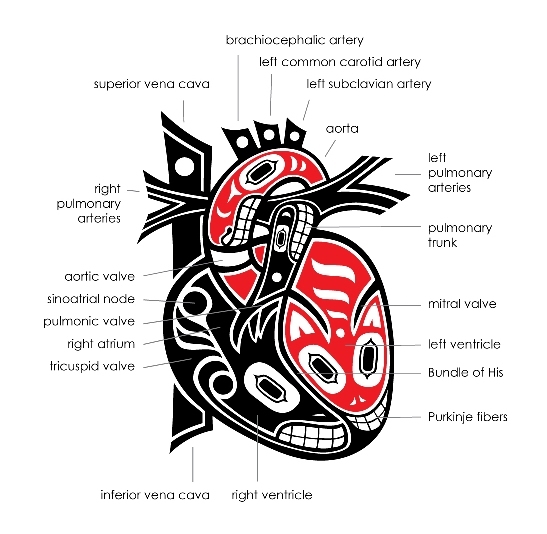 In her first year of medical school, Michiko created an art piece titled “Spirit of the Heart” which was awarded the grand-prize of the Heartfelt Images contest, an art contest for first year UBC medical and dental students organized by the Cardiovascular Block Chair, Dr. Carol-Ann Courneya. The black spirits, the whale and the seal, represent the deoxygenated blood that flows through the right side of the heart and the red spirits, the fox and the bird, represent the oxygenated blood flowing through the left side. The major anatomical components, including the valves and major vessels, are maintained in their anatomical position. Even the electrical system that controls the contraction of the heart is included within the lines. “Spirit of the Heart” had grabbed the attention of Haida Artist Clarence Mills in Vancouver, B.C. In the summer of 2011, Michiko became the first apprentice of Clarence Mills who taught her totem pole carving, repousse jewelry and silk-screen print making. Michiko has transformed “Spirit of the Heart” into a limited edition hand pulled acrylic silkscreen print. The prints are approximately 15 x 22 inches, water-based acrylic paint on heavy weight Stonehenge acid free paper. Would you make a t-shirt of this image? I do plan on making “Spirit of the Heart” t-shirts and other items (tote bags, gift cards, magnets, pens, etc..). Hopefully in the near future. I came across this image quite by accident and it took my breath away! My now 40-yr old son had a heart transplant almost 20 years ago – he is doing well and living life to the fullest! This is the most beautiful image of a heart I have ever seen. It truly depicts The Spirit of the Heart! A print of this is in the cardiology waiting room at our children’s hospital. It is simply stunning and so so meaningful. Thank you.